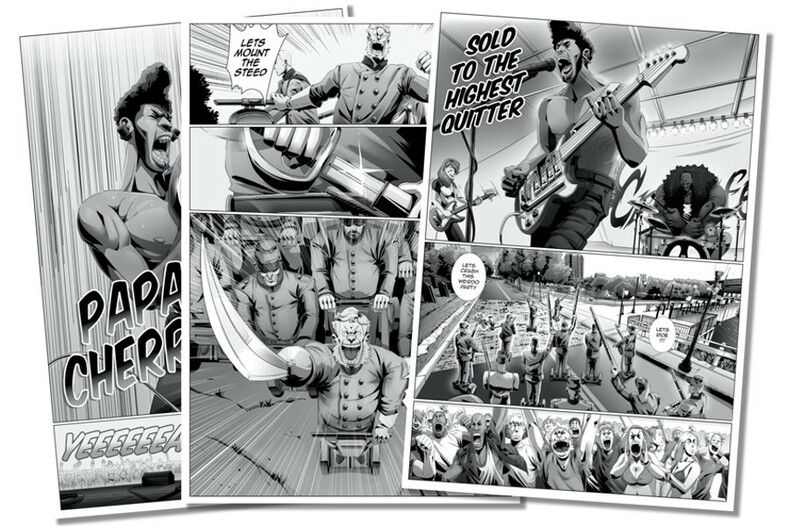 “Papa Cherry,” a graphic novel set in Richmond features black rockers, slave zombies and Confederate re-enactors on Segways | Arts and Culture | Style Weekly - Richmond, VA local news, arts, and events. A couple of panels from the comic book series Papa Cherry created by Saxton Moore and illustrated by Richmonder Phillip Johnson. The first volume is set in Richmond. The first volume of what's planned to be a 13-part comic book series called Papa Cherry is set in Richmond with a supernatural take on the city's Civil War history and music scene. The series creator, Colonial Heights resident Saxton Moore, also founded the project's publisher: Pixel Pirate Studio, an animation company that was based in Shockoe Bottom before it moved to California. And the book's illustrator, Phillip Johnson, lives in Richmond. The first book in the series, "Virginia is for Lovers," revolves around the band Papa Cherry, whose leader, Papa McAfee, sold his soul to the devil — a swashbuckling white woman named Lois who manages the band — so he could become a rock legend. The first stop on the band's East Coast tour is in Richmond at the same time and place, alongside the James River, that a Civil War re-enactment has been scheduled. "Papa Cherry" takes inspiration from the classic American blues legend of Robert Johnson selling his soul to the devil at the crossroads in exchange for his legendary guitar skills. And it helps that Moore's daughter plays guitar in the local band Waiting for Silence. Part of the reason Moore launched Pixel Pirate in 2009 was to give African-American artists and characters better representation in the animation industry. So he wondered: What would that classic blues myth of selling one's soul to the devil look like today? "I took that concept and made it modern day to inspire young kids of color to be a rock star," Moore says, adding that he set the first book in Virginia to help readers get beyond headlines about Confederate symbols. "I wanted to put Richmond on the map." That's not to say "Papa Cherry" shies away from the Lost Cause narrative that's kept alive along Monument Avenue and beyond. Rather the book is an entertaining but sophisticated send-up of modern day bigotry. Confederate re-enactors ride into battle on a cavalry of Segways. The fighting takes place along the James River where slave zombies emerge to take on the latter-day Confederates. One panel depicts the remains of slaves getting reburied at Hollywood Cemetery alongside Confederate graves — a bit of irony, Moore says, inspired by the controversy over Virginia Commonwealth University paving a parking lot over a slave burial ground that was later removed. "I take bits of facts and turn it into entertaining fiction," Moore says. "It makes the world [in the book] more real." In addition to the antics, "Papa Cherry" contains heartfelt reconciliation. The character named Virginia is the "ghost of a broken hearted slave woman who worked at the Jefferson Hotel." In the first image readers see of Virginia, she is crying what appear to be tears of blood. When she reunites with her husband in the form of a zombie Union soldier, their souls can finally be at peace. Other Richmond haunts on display in the book include convincing depictions of Richmond's waterfront up and down the James and scenes set at the National and the Edgar Allan Poe Museum. Moore grew up in Atlanta and fell in love with animation as a boy watching Walt Disney introduce his films on television. Seeing the men illustrating the film he was about to watch convinced Moore that he wanted to make cartoons some day. Since those early days, Moore has worked for Cartoon Network and Nickelodeon. He launched Pixel Pirate to create content that focuses on people of color. "I didn't see people who looked like me represented in animation as much," Moore says. In 2011, the studio made a pilot program "Epic Abraham" featuring Abraham Lincoln and zombies. Moore originally wrote a script for "Papa Cherry" as an adult animated series — violence and sexuality feature in the book. He says he has gotten interest from investors to that end. Turning "Papa Cherry" into a graphic novel was a way of building momentum for getting the story made into a show. The effort appears to be paying off. A Kickstarter campaign for the graphic novel saw 132 pledges for $16,429. Moore says the strength of the book is opening the doors to more meetings with people interested in "Papa Cherry." Moore says he is grateful to the stores World of Mirth in Carytown and Velocity Comics near Virginia Commonwealth University for carrying copies of "Papa Cherry." Order "Papa Cherry" here at Comixology.